Palestinian Authority fails to cancel payments to terrorists and their families, PMW sends letter to US Sec. of State. The Palestinian Media Watch (PMW) sent a letter to Acting Secretary of State John Sullivan and Secretary of State Designate Mike Pompeo regarding the Palestinian Authority's (PA) failure to implement the terms of the Taylor Force Act. The Taylor Force Act cut United States funding to the Palestinian Authority (PA) unless the PA ceases to pay terrorists and their families. In the letter, PMW noted that "'Section 4 of the Taylor Force Act (TFA), passed on March 23, 2018, requires that the Secretary of State certify that the Palestinian Authority (PA), the Palestine Liberation Organization (PLO) and any successor or affiliated organization "are taking credible steps to end acts of terrorism'; 'have terminated payments for acts of terrorism'; 'have revoked any law, decree regulation or document authorizing or implementing a system of compensation for imprisoned individuals'; and 'are publicly condemning such acts of violence' or face a limitation on the US aid provided to the PA."
They also noted that "the PA media has not reported any steps to end acts of violence by Palestinian terrorists against Israeli and American citizens. On the other hand, it has continued to glorify and honor terrorists." "Just days following the passage of the TFA, the Palestinian Authority publicized the PA budget for 2018, which had recently been approved by [Palestinian Authority Chairman] Mahmoud Abbas. PMW's analysis of the budget demonstrated that the PA had not fulfilled the terms of TFA and were continuing to pay salaries to terrorists and allowances to families of 'martyrs.' In fiscal year 2018 the PA allocated 550 million shekels ($158 million) for the payment of salaries to terrorist prisoners and released terrorists and 687 million shekels ($197 million) were allocated to the payments to families of 'martyrs' and wounded. 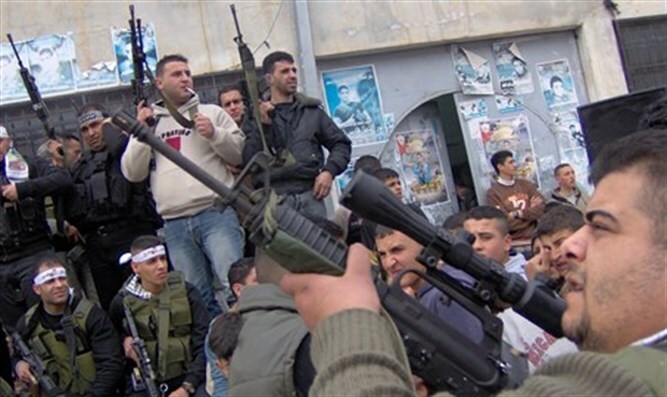 "Most significantly, in an act of complete and open defiance of the TFA, the PA stopped attempting to hide that it is the PA that pays salaries to all the terrorist prisoners. In its 2018 budget, for the first time since 2014 when it attempted to deceive the international community, the PA now openly lists the sums allocated for these salaries to the Commission of Prisoners' Affairs as a direct PA budgetary expense. "Needless to say, the honoring and glorification of terrorists and acts of violence is not only deplorable, but is precisely the opposite of the TFA's requirement that the PA, the PLO and their affiliated organizations condemn terror."